The Wolfgang Porter Cable 7424XP Swirl - Free Kit 3.0 is a complete paint care kit. Restore and protect all types of paint with this Wolfgang collection. The Porter Cable 7424XP and Lake Country pads make paint correction easy. For a Limited Time, receive a BLACKFIRE Polish 2 oz. sample, a BLACKFIRE Compound 2 oz. 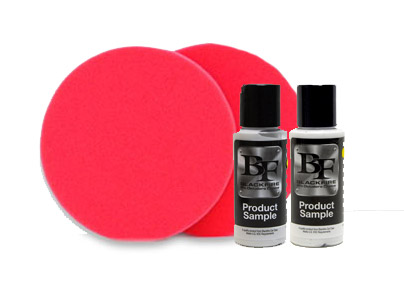 sample, and 2 5.5" Red Soft Wax Pads FREE with the purchase of this kit! The Wolfgang Porter Cable 7424XP Swirl - Free Kit 3.0 combines the latest in German paint correction technology with the user-friendly Porter Cable 7424XP Dual Action Polisher. In two steps, you can restore your vehicle's smooth finish. Then add Wolfgang Deep Gloss Paint Sealant 3.0 to lock in the shine. 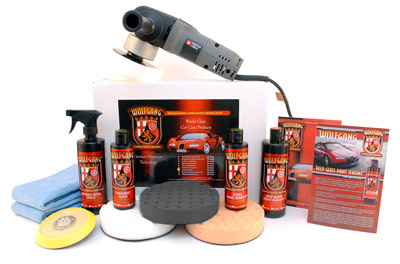 This is a complete detailing kit for all types of paint. The Porter Cable 7424XP Dual Action Polisher has all the user-friendly features of the original Porter Cable 7424, but a 4.5 amp motor enables enhanced performance and durability. The Porter Cable 7424XP Dual Action Polisher operates from 2,500 OPM to 6,800 OPM to provide a faster defect removal rate. The 7424XP features all ball and roller bearing construction with spiral/bevel gears and an improved switch design. The buffer accepts a 5/16-24 spindle thread. The pad diameter is 6 inches. The polisher includes a wrench, side handle, polishing pad, and a operating manual. Dual Action 5 inch Flexible Hook & Loop Backing Plate� is constructed of urethane has hook and loop material permanently secured from edge to edge. A recessed edge protects the paint from impact and the post is made of durable stainless steel. The 5/16 inch thread fits any dual action polisher with a corresponding thread. Wolfgang Total Swirl Remover 3.0 combines Wolfgang�s diminishing abrasive technology with Menzerna�s special milling process, which produces consistently sized, fast cutting abrasives. Wolfgang's specially milled abrasives work to eliminate imperfections without creating new ones. These small abrasives are milled for consistency. As they smooth over a scratch, the abrasives diminish at the same rate because they all started at the same size. The result is smooth paint in fewer steps. Wolfgang Finishing Glaze 3.0 is a water-based emulsion with ultra fine diminishing abrasives that gently polish the paint to a brilliant gloss. Compounding swirls, mild oxidation, and water spots disappear to reveal glassy smooth, beautiful paint. Underneath a wax or sealant, the paint radiates with energy and gloss. Wolfgang Deep Gloss Paint Sealant 3.0 features fortified polymer technology. Wolfgang�s German Super Polymers are fortified with more dirt-repelling power to keep your vehicle cleaner and shinier, longer. Enhanced super polymers have an amazing anti-static property that repels water, oil, dust, and road grime to provide unsurpassed paint protection. Your vehicle stays cleaner because foreign molecules literally slide off the clear polymer coating. Your vehicle will have a deep gloss and unbeatable protection for months. Wolfgang Instant Detail Spritz is formulated with high-tech German super polymers. These highly-reflective polymers form an ultra-thin protective coat that bond to the paint sealant or wax finish and leave your vehicle with a slick, silky surface�plus Instant Detail Spritz extends the life of the sealant or wax with regular use. CCS Orange 6.5 Inch Cutting Foam Pads is included for general swirl and defect removal. Orange pads are less aggressive than the yellow pads. Use the orange pad to apply swirl removers and polishes. CCS White 6.5 Inch Heavy Polishing Foam Pad is designed to apply cleaner waxes, micro-fine polishes, and light swirl removers. The foam is less dense than a cutting pad but more dense than a finishing pad. CCS Black 6.5 Inch Finishing Foam Pad is very soft and intended for the application of waxes, glazes, and paint sealants. Two 16 x 16 inch Blue Microfiber All Purpose Towels are spun from an 80/20 polyester/polyamide blend, producing a highly refined microfiber. The microscopic polyester/polyamide fibers are split with a unique process that creates a every soft, absorbent texture. A total retail value of $337.89. Save $47.90! Je suis vraiment satisfait de ce kit, tout est ok.